One week camp sessions throughout the year. Ideal for ages 7-15 years old. Kids start out with fantastic driving tuition from the experts at the Dubai Autodrome. The camps lead into races and competitions, developing their skills and lap times as the week goes by. Go-Karting is not all that is on offer at Kartdrome Camp. Kids have a blast with Laser Tag in the medieval maze, race room simulators, billiards tournaments, playstation alley and lots of fun games! There are competitions all week with medals and prizes for our champions. Each Holiday Camp runs each day for a week (Sunday-Thursday). 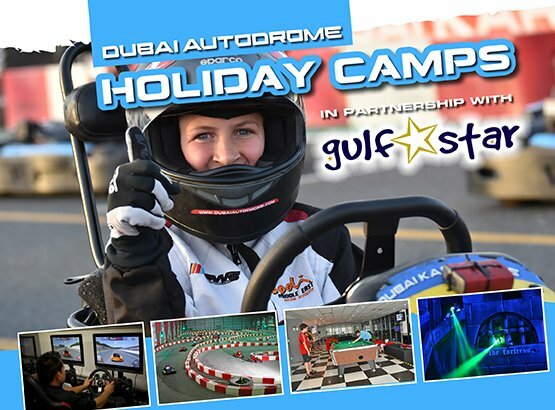 Camps are charged at AED 1150 per week with an ‘early bird’ special of AED 995 if booked 2 weeks in advance. Booking siblings or multiple weeks can also avail of the early bird rate. Limited to just 40 spaces per week. Day passes available upon request.